Our company is the best choice for construction projects. We pride ourselves in providing comprehensive solutions to engineer and design safe and efficient inside and outside plant networks of all kinds. Often times companies that come to us have already had a project fail using another company to get the job done. Whether your project is new or needs saving our professionals will ensure it is done perfectly. We will work with your staff to achieve your goals both large and small accurately, on time and on budget. From planning and design to site and field engineering, our professionals use the latest technologies available to create reliable and effective networks. Our project management team is second to none and takes responsibility of coordinating day-to-day activities throughout the project life cycle. Our team is dedicated to your project from the initial start-up phase until the completion of the project. In addition, our team will oversee all aspects of your project including quality assurance, safety and efficiency from beginning to end. 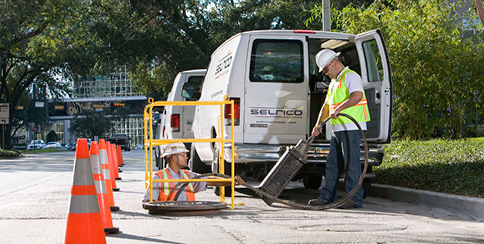 With a concentrated background of Inside Plant (ISP) installation techniques, Selrico can meet your entire ISP cabling need. From FOC for Backbone/Riser cabling to Copper drops, we can provide any ISP installation required from the simplest to the most advanced design and need. Ranging from LAN/WAN cabled networks to CATV cabling, we can help you in all of your ISP initiatives. The demand for outside plant construction such as underground fiber construction has increased rapidly in both large and small communities as broadband providers drive fiber deeper into their neighborhood and we have been helping to fill that need. Internally, companies need technology such as in-building wireless capabilities to meet the demand of the countless devices businesses use in their day to day practice. Whether your needs are inside or out our flexible and dependable team will make sure that they are met and exceeded. Our technicians are trained, certified and experienced in latest installation standards and methods of cabling in single, multi-story building and campus environments. We have worked in medical, hospital, production line, chemical plants and general administrative office environments for voice, data and multimedia for over 15 years. Training is essential for our staff on all existing industry standards (BICSI) and manufacturer’s suggested standards for placement of copper & fiber and phone system architectures as well as proper labeling and testing procedures. Let Selrico be your single source solution. Each service agreement is customized to our customer’s network requirements. We proudly stand behind each and every project we undertake.